After the reading at Waterloo Gallery, as I drove Nduka Otiono back to his cousin's in South London, he reflected on the way things had come together and said, "this is how literary history is made." He was right. 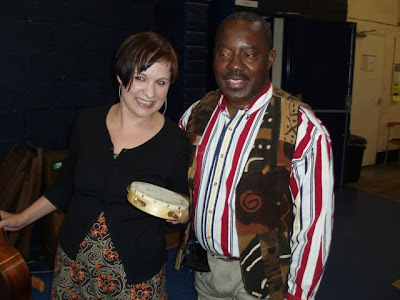 It all began in early May 2008, when Molara Wood wrote an e-mail informing me that Nduka Otiono was to visit the UK in June and wondered if we could organise a reading for him. I thought it was possible. But I had not been informed by Nduka Otiono himself that he was coming to England, so I could not do much. Nduka's e-mail came about 48 hours later and I said let's do it. I checked my calendar and figured I could have the gig on the 20th of June. Then on the 17th of May, 2008 I attending the premiere of The Asylum - a film directed by my friend Obi Emelonye, at the Odeon Surrey Quays. As I arrived at the foyer, I met actor Anthony Monjaro whom I've known since 2000, and he was chatting with a young woman. Monjaro introduced the young woman as Aletia, and she quickly said her name in full: Aletia Upstairs!. It took me all of 5 seconds to realise Upstairs was part of her name, and I found it refreshing. I also learned that she was a Jazz singer/songwriter, and that she had already released an album entitled "Possibility. "Never one to miss an opportunity, I asked her if she would be happy to perform at a poetry reading I was organising for a visiting Nigerian poet. "I would be delighted" she said. Due to venue problems, the event finally took place on the 18th of June and attracted a small but respectable audience which included film directors Obi Emelonye and George Kelly, Dr Chikwe Ihekweazu and his wife Ijeoma, Tim Pardon of the Financial Times, Molara Wood and others I did not get their names. But it went very well. Nduka Otiono's reading was great and Aletia Upstairs was a revelation and I thought immediately I must work with her again soon. It was indeed a great Literary Evening. Aletia Upstairs playing at the Eastern Light Literary Evening, June 18, 2008 and Nduka Otiono reads below. (These are short/incomplete clips. 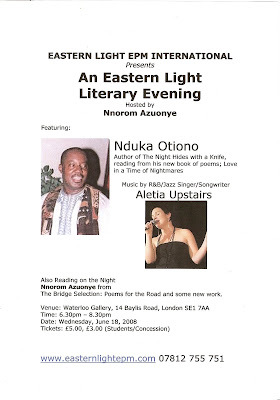 An Eastern Light Literary Evening hosted by Nnorom Azuonye will be held on June 18, 2008 at Waterloo Gallery, 14 Baylis Road, London SE1 7AA. For more details please click on the event leaflet below for a larger image.